WSO2 Governance as a Service is an online multi-tenant supported instance of WSO2 Governance Registry which is the solution for SOA Governance from the WSO2 SOA stack. You can start trying out WSO2 Governance as a Service by accessing the http://governance.cloud.wso2.com and creating an account for your organization (free for limited use). In order to identify your account, you have to provide the domain name of your organization. 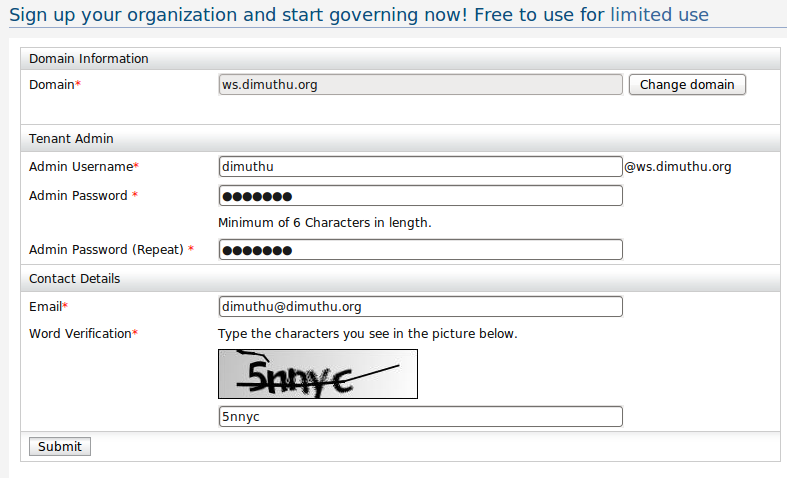 I will demonstrate how to create an account using the “ws.dimuthu.org” as my domain name. 1. First go to http://governance.cloud.wso2.com from a web browser and click the ‘Register’ button. You will be asked to enter the domain name as the first step. After that, you have the option of validating the ownership of the domain right at the registration process, or you can skip the validation and continue to the next step in which case your domain will be appended ‘-trial’ suffix. You can validate the ownership of the domain later at any stage. Here I want to validate the domain right now, so I click ‘Take me to the domain ownership confirmation page straight-away’ and click the ‘Submit’ button. 2. 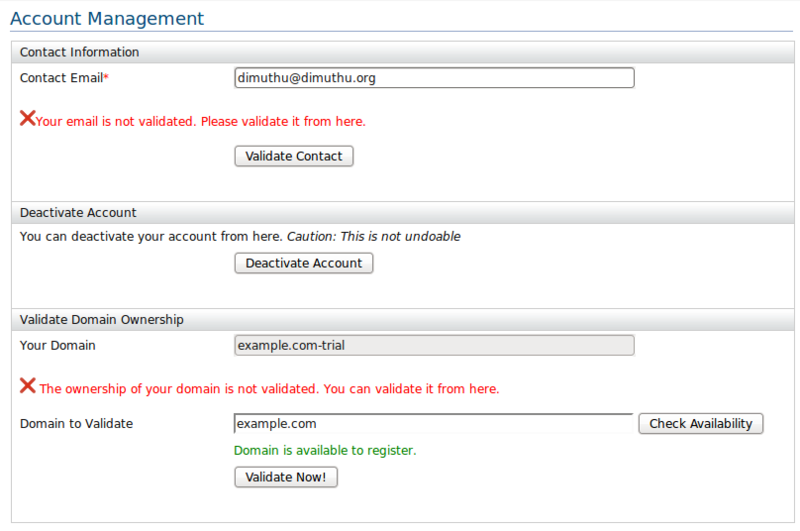 This will redirect you to the domain ownership validation page. You can validate the ownership of your domain in one of two ways. Method i). Just create a text file named ‘wso2gaas.txt’ in the web root of your domain and enter the given text. This is the most simplest method of two. Method ii). You can put a DNS entry according to the given instructions. This is a little tedious approch to validate the domain. In fact it may take a while to propagate the new DNS information, so you may have to wait hours without refreshing the page until you finally validate the domain ownership. Click the continue button after the domain validation done. Then you will be redirected to a page requesting more information. 4) After this step, you will be notified to check for your email which will contain a mail with a link to proceed with the registration. There you will be able to select a theme for your organization and finalize creating your account. Login to the admin account for your tenant with the credential you provided a the time of the registration. The domain ownership validation was introduced to WSO2 Governance as a Service account registration only now. So for organizations who have already have account will have a message similar to this when they are trying to login to their account. So the account I have registered using the domain name ‘example.com’ has been renamed to ‘example.com-trial’. As the instruction of the message says you can go to the account management page after the login and validate the domain ownership. This entry was posted in Cloud, GaaS, Governance, Governance Registry, SOA, Tutorial/Guide, Uncategorized, web services and tagged gaas, Governance, SaaS, services, SOA, wso2. Bookmark the permalink. WSO2 cloud services for identity is also released. You can access it from here, https://identity.cloud.wso2.com.